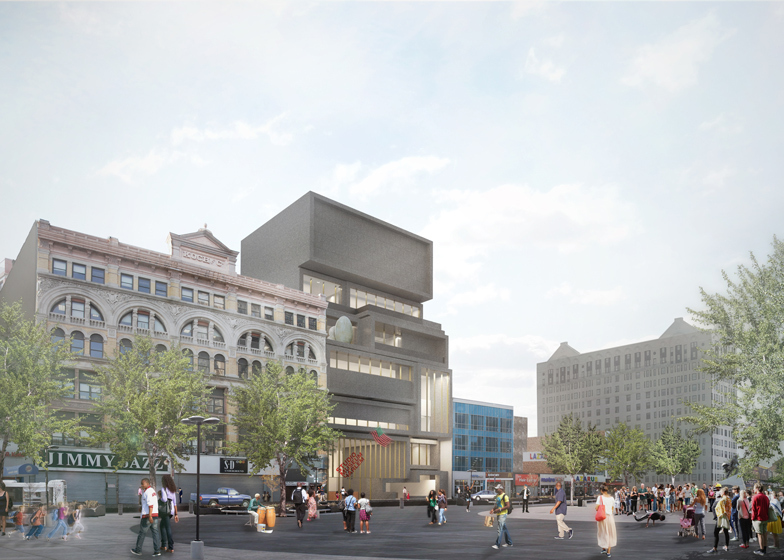 British architect David Adjaye has been commissioned to design a new home for the Studio Museum in Harlem – an institution dedicated to promoting the work of artists of African descent. The New York museum is currently housed in a renovated, century-old building on 125th Street, which runs through the centre of the historic African-American neighbourhood. Adjaye's building will replace this, and will also extend the museum into an adjacent lot. The new facility will be the first designed expressly for the museum's program, which showcases work by artists of African descent and work inspired by black culture, dating from the 19th century to present day. It holds more than 2,000 pieces in its permanent collection. Adjaye – who recently completed work on a housing block in Harlem – took cues from Harlem's brownstone buildings, churches and "bustling sidewalks," with his design for the five-storey museum building. "This project is about pushing the museum typology to a new place and thinking about the display and reception of art in innovative ways," said Adjaye. "It is also about a powerful urban resonance — drawing on the architectural tropes of Harlem and celebrating the history and culture of this extraordinary neighborhood with a building that will be a beacon for a growing local, national and international audience." The proposed design shows a choppy facade of irregular blocks that stands in contrast to the low-slung, blocky commercial buildings that line 125th Street. The facade will be punctuated with windows of varying sizes – a fenestration style that was inspired by the masonry-framed windows that characterise the area's apartment buildings. To amplify the museum's street presence and emphasise its function as a social hub, Adjaye has conceived a 199-seat "inverted stoop" – a set of steps that leads down to the museum's lower level and can be used for screenings, performances and other events. Stoops are a common feature in historic brownstone buildings. For the upper portion of the museum, Adjaye has proposed a terrace that overlooks 125th Street. Inside, the museum will feature a four-story atrium that is meant to mimic "the radiant, soaring volumes of church sanctuaries." A switchback stair will rise up through this space, with multiple landings serving as look-out points. David Adjaye says his architecture "has to have a social agenda"
The building, slated to cost $122 million (£79,000,000), is being funded through a public-private partnership. So far, New York City has allocated $35 million (£23,000,000) for the project. New York-based Cooper Robertson – which previously worked on the Renzo Piano-designed Whitney Museum of Art – will serve as executive architect and program planning consultant. Studio Museum intends to submit Adjaye's conceptual design to the city's public design commission on 14 July 2015. If all approvals are granted, the existing building will be demolished, and construction of the new museum will be underway in 2017 – the year of the museum's 50th anniversary. Completion is scheduled for 2019. The museum first opened in 1968 in a rented loft on 125th Street. Since 1982, it has operated in the century-old building renovated for the museum by late African-American architect J Max Bond Jr. In 2001, Rogers Marvel Architects redesigned several parts of the museum, including its entrance and auditorium. "The world of the arts and Harlem have both changed dramatically over the half century since our institution was founded, and we're proud that the Studio Museum has been a catalyst in those developments," said Thelma Golden, the museum's director and chief curator. "With the help of the brilliant David Adjaye, who is giving us the first facility designed expressly for our needs, we will foster the next generation of artists." The project is a significant addition to the Tanzania-born architect's ever-growing US portfolio, which includes the Sugar Hill Museum and housing development in Harlem and two neighbourhood libraries in Washington DC. Founded in 2000, Adjaye's firm has offices in the UK, US, Germany and Ghana. He also designed the Smithsonian Institution's National Museum of African American History and Culture on the National Mall in Washington, DC, which is expected to open in 2016.